Pakistan is manufacturing and supplying footballs for use in all 64 matches of the World Cup 2014 in Brazil. In addition, most European football leagues have place huge orders to buy Brazuca balls designed by Adidas and made in Pakistan. Brazuca football is made from six identical propeller shaped polyurethane pieces glued to a rubber bladder and thermally bonded together. It weighs 437 grams and measures 69 cm in circumference. 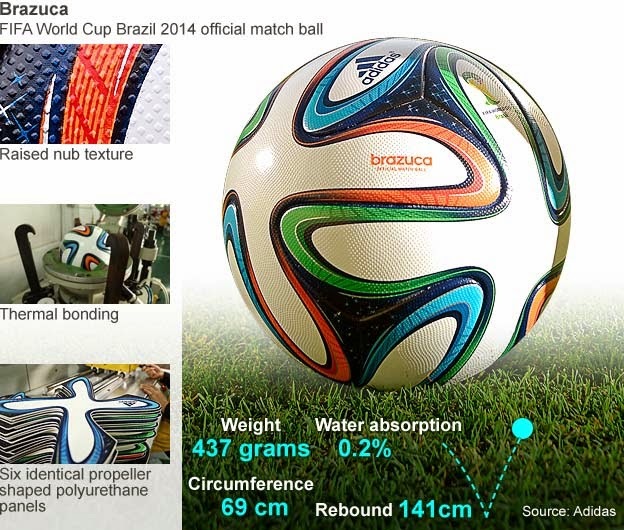 Pakistan produces the high-quality polyurethane used in manufacturing Brazuca football panels. Brazuca is quite different from the traditional soccer balls which have historically been made of leather pieces stitched together in Sialkot, Pakistan. Polyurethane balls are water-resistant and maintain their shape much better than the leather balls under a variety of conditions in terms of temperature, pressure and humidity. Leather balls have a problem specially if they soak up the water when it rains during play. Pakistan was chosen to supply the ball after China, the supplier of Jabulani for 2010 World Cup, was unable to meet FIFA's requirements. 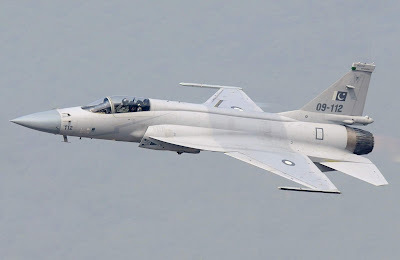 Pakistan has not only earned the honor of manufacturing the ball that will be used in FIFA 2014 matches but also outdone both India and China in supplying tens of millions of footballs to European nations that place bulk orders for promotional purposes, according to India's Economic Times. The Brazuca design is an improvement on the Jabulani ball used in 2010 World Cup in South Africa. Jabulani was too smooth with shallow seams, a problem that has been fixed in the Brazuca by adding raise nub texture and creating deeper seams making its flight more predictable. The 2010 Jabulani ball had eight panels. The 2006 ball had 14. Before that, the balls were made of 32 internally-stitched panels. By decreasing the number of panels, they decreased the seams, creating a smoother surface. This smoother surface allows it to travel at higher speeds before it started knuckling. Knuckling is when the ball wobbles in the air, following an unpredictable flight path. It's a tool for strikers, a menace for goalkeepers. Researchers at the Center for Sports Engineering Research at Sheffield Hallam University in the UK measured the seams of the Jabulani and the Brazuca, and found that the Jabulani's seams are about .48 mm deep compared to 1.56 mm for the Brazuca. The seams on the Brazuca stretch to 327 cm, compared to 203 cm on the Jabulani. The Brazuca ball went through a range of scientific tests to assure that it would complement the players' skills on the field, rather than adding a skill set all its own. "We do extensive flight path analysis and the results have shown constant and predictable paths, with deviations hardly recognizable," Matthias Mecking told the BBC. Mecking is Adidas's football director. "We've come full circle," NASA Ames Research Center scientist Ravi Mehta told the CBS News. "It's back to knuckling at about 30mph." He was not involved in the design but has tested the ball. Another important factor, he says, is the amount of friction between the ball and the player's boot. Dr Mehta explained that when a relatively smooth ball with seams flies through the air without much spin, the air close to the surface is affected by the seams, producing an asymmetric flow. This asymmetry creates forces that can suddenly knock the ball, causing volatile swoops. Those who are familiar with the cricket ball know that seams and rough surfaces play a crucial role in how the bowler can make it swing in flight, a technique pioneered by Pakistan's Waqar Younis. Knuckle ball technique used by some Baseball pitchers is similar. The use of seams and roughness of the ball are tools for the bowler or pitcher but a menace for the batsman or batter at the other end. While Lyari remain the leaders when it comes to the Fifa World Cup fan-following, other regions of Pakistan are only some distance behind in their fervent passion for the tournament. The spectacle seems more of a movement than a sports event for the youth – and even the older fans – in the country. Two of such examples are Chaman and Quetta, where the fans are quick to assure that their dedication to football is no less than what is witnessed in Lyari. “We have nothing but football,” former national captain Essa Khan told The Express Tribune from Chaman. “Everyone is glued to the big screen. In Chaman, we have three places where screenings are taking place and people gather around. Meanwhile, Essa said that Thursdays are the most crowded days, and fans pour out to watch the matches till the morning. Similarly, traders coming from the Afghan border also stay. Essa says every single World Cup match has been screened at his academy and spectators showed up every time. Meanwhile in Quetta, former national player Jadeed Khan said that the football fans have brought their jerseys and are following matches religiously. “There aren’t any big screenings in the city due to the law-and-order situation, but we all gather around to see our favourite teams play,” said Jadeed. According to Islamabad Football Association officials Zaklir Naqvi, the World Cup fever has grown exponentially in the city. “The best example that I can give is that we were having a seven-a-side tournament last week, and most of the players would show up sleepy in the day, because they were up watching the World Cup matches,” elaborated Naqvi. Laiba, an eight-year-old-girl in Islamabad, plays football every morning on the streets. She said that even though she has no idea about the rules of the game, she knows that as a goalkeeper, it is her job to ensure that the ball needs to be stopped from passing the goal-line made by pieces of rock. Umer Farooq’s grandfather and father made bagpipes. Now he is the third generation to take up the tradition in Pakistan, which is thousands of kilometers from Scotland yet sells thousands of bagpipes each year. Covered in sawdust, they carve the wood and polish it. Rosewood or ebony serve as the blowstick, into which players exhale. The drones — long pipes with a lower tone — follow a similar process. They are then attached to a bag, and often covered with tartan, a colored plaid fabric typical of Scotland. The bagpipe arrived in the mid-19th century when British colonialists brought it to subcontinental India, of which Pakistan was a part before independence in 1947. “Anywhere the British Army went, they took pipers with them,” said Decker Forrest, a Gaelic music teacher at the University of the Highlands and Islands in Scotland. Locals seized on the tradition, which remains popular, with dozens of bagpipe bands available for weddings and religious festivals. “People love the bagpipe,” said Yaser Sain, the leader of a Sialkot trio who play at least two performances each day. Proudly he shows pictures on his mobile phone of the band in colorful costumes. Forrest said Pakistani bands put the emphasis on how they look, rather than musical technique, “which is less important to them.” At the world bagpipe championship, which is held every year in Glasgow, they are “the most beautifully dressed,” he said. The kilt, however, is not de rigueur among the Pakistanis. In 2014 it established a camel-mounted bagpipe band attached to a unit of desert rangers. The camels, draped in scarlet and gold as their musicians sway above them, are particularly appreciated during parades. But Pakistan’s main affiliation with bagpipes is its mass production of them, though the quality of the instruments it makes can vary. Some 2,600 are exported from the Mid East factory each year, mainly to the United States. The M.H. Geoffrey & Co. workshop, also in Sialkot, claims to manufacture a further 500 annually. Its owner, Zafar Iqbal Geoffrey, estimates that when contributions from dozens of small- and medium-size businesses in the city are counted, Sialkot can produce a total of 10,000 bagpipes a year. That is more than any country other than the United Kingdom. “Bagpipes are our roaming ambassadors. This is good not only for the economy, but for the image-building of Pakistan,” said Waqas Akram Awan, vice president of the Sialkot Chamber of Commerce. The city’s exports for 2017 — a 15-year record of $4 million for thousands of instruments — underscores his comment. “Our instruments are the same as the European ones, but they are much cheaper. We make music more accessible,” said Umar Farooq’s uncle Muhammad Aftab. Cheap labor means Pakistani bagpipes are priced less expensively than ones made in Scotland, with Mid East’s going for around £300 ($390) in Britain, compared to £900 ($1,170) for instruments made in Scotland.